Integrating with Openbucks is easy! 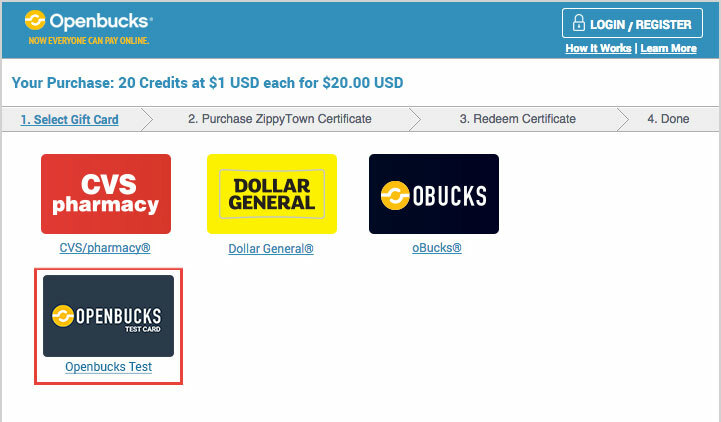 An Openbucks payment starts by you redirecting the user to the Openbucks hosted checkout flow. In this flow Openbucks collects the payment information from the user and redeems the funds. Openbucks notifies you on the success of the transaction, and redirects the user back to your website. You can specify the return URL in your account settings, or provide them dynamically with each payment. Openbucks has two environments: Sandbox and Production. In the Sandbox you will be able to make payments without real money involved. When you complete your Sandbox integartion, you will need to activate your production environment here. Card numbers for the Sandbox are provided here. There are two forms in which you can validate successful transaction details: (1) Openbucks will send you a notification to a predetermined postback url before redirecting the user back to your site. (2) Openbucks provides an api to retreive the transaction details at any time. Use the tracking id provided in the 'tid' GET parameter of your success return url. Check also our Code Samples and FAQ sections for help with your integration. Openbucks works with large Retail brands like CVS/Pharmacy and Dollar General, ePlus and Pacific Coffee. Our ability to work with these brands also means we have to adhere to some brand standards and regulatory requirements. The Openbucks network is comprised of major national and international retail brands. In accordance with Retailer brand standards and requirements, ***the Openbucks payment button must be displayed on the Merchant payment wall or checkout page before any and all non-brand and non-network payment options*** (including but not limited to any 'alternative' payments options). Additionally, if there is a fold (such as a 'more options...' button), the Openbucks payment button must be displayed above the fold. The exact text used to describe the payment method must be: "Pay with Gift Cards". The graphics displayed to illustrate the payment method should be provided by your account manager or selected from the library of graphics provided here. Openbucks has two environments: Sandbox and Production. Sandbox is used for integration testing where no real money is used. Each environment has three keys: Public Key, Secret Key, API Secret Key. Secret Key: used by Openbucks to authenticate you on payment requests. This is a secret and should never be visible to a user. API Secret key: used by Openbucks to authenticate you on api requests. This is a secret and should never be visible to a user. To better serve the end user, Openbucks hosts the payment button image and does not provide static button images. By hosting the image we are able to display the most appropriate brands to your end user based on availablity of retailers on our platform and the users geo location. Note that if you load the Openbucks payment panel within an iFrame, the minimum size of the iFrame should be 724 x 479. Openbucks provides button images in several styles and sizes to choose from (listed below). *Note: If your site requires alternative layouts, dimensions, card displays or file formats, please contact your Openbucks account manager and we will create a custom button specific for your checkout page. To initiate a payment with Openbucks you need to send a POST request to the Openbucks payment URL. The POST parameters are described later in this section. Upon receiving your POST request, Openbucks will authenticate your identity, and guide the end user through the checkout process. Upon completion, you will be notified that the transaction has been completed and the user will be redirected back to your website. Statically add a form with hidden fields that is preconfigured to POST to the Openbucks payment URL when the Openbucks payment button is selected. Copy and paste the form below or check our hidden form code sample for a working example. Exchange the placeholders with your own values. The form is prepopulated with your public key. req_currency_code USD 3 char 3-letter code identifying the currency. Supported currencies: "CAD", "EUR", "GBP", "HKD", "PHP", "USD"
Description of the product being sold, as accurate as possible. The req_item_description can contain diacritical characters. But these characters must be escaped for HTML. Failure to do so will result in a 400 XML parsing error. Refer to wikipedia.org for a table of the HTML entities.If you want to specify a Unicode character that does not have an HTML entity, you can alternatively use a Unicode XML entity ("&#nnnn;") which works both in XML and HTML. Your own tracking ID for this transaction. Must be unique. The Openbucks Payment server will echo it for correlation purposes. This ID is the one that you should use to correlate your own data on your systems. Any type of customer ID you can provide, that enables Openbucks to identify repeat visits by the same customer. This parameter is required for fraud prevention purposes. This must be an anonymous ID, such as a one-way hash of the customer ID or customer's login name or customer's email address or any other value that uniquely identify the customer on your internal system. The Public Key is used by Openbucks to identify you on all payment and API requests. It can be found under the Account Information & Settings page. Note: Change to the production Public Key when switching to Production mode. This value is used to authenticate you (see req_hash below) and to prevent replay attacks. IMPORTANT: To be computed on the server side only. You can use whatever method you want to generate the random characters. The SHA-256 hash of req_token + [secret_key] + req_merchant_tracking_id + req_amount + req_currency_code + req_force_cards where [secret_key] is your Openbucks Secret Key, and req_force_cards should be concatenated only if it is set. The hash must be formatted in lowercase hexadecimal with no byte separator. The Secret Key is used by Openbucks to authenticate you on all payment requests. It can be found under the Account Information & Settings page. Note: Change to the production Secret Key when switching to Production mode. See example of how to calculate the hash here. req_customer_info_email [email protected] 63 The ability to associate transactions with an email helps us enforce strict velocity rules and improves security. Optional, but recommended. The ID of the product being sold. You can use your internal ID scheme or just any ID of your choice. However, we do ask that you use a separate ID for each distinct product type. Example: a package of 500 LuckyBucks is "LB-500", while a package of 1,000 LuckyBucks is "LB-1000" and one of 3,000 is "LB-3000". A URL to which Openbucks will return the user after a successful transaction is complete. If no URL is supplied here, the default URL defined in the Account Information & Settings page will be used. If neither URLs are provided, the user will not be redirected back to your site at the completion of the payment. Note: The URL needs to include the "http://" or "https://" prefix. A URL to which Openbucks will return the user after a transaction is canceled. If no URL is supplied here, the default URL defined in the Account Information & Settings page will be used. If neither URLs are provided, the user will not be redirected back to your site when a transaction is canceled. Use this parameter to link the user directly to a specific gift card checkout, bypassing the gift card payment wall selection step. The possible values for this field can be found in the API ID column of the Review Available Cards page in the Sandbox Merchant Admin Portal. Use this parameter to force only specific gift cards to be listed at checkout. Cards should be separated by '|'. If you are a publisher or an aggregator of multiple websites, you should use the sub property fields to describe the website that the payment is being initiated from. The sub property information is used to provide better reporting, invoicing, analytics, risk management and information to you, Openbucks and the end consumer. The sub property id can be any kind of unique identifier of the website, for example the id used to store the website information in your database. req_sub_property_name Lucky Bucks Inc. 127 The legal or commonly used name of the website the payment is being initiated from. req_sub_property_url http://www.luckybucks.com 127 The URL of the website the payment is being initiated from. In the event of a successful transaction, you will need to obtain and validate the transaction details. Postback Listener - Openbucks can send the transaction details to a URL of your choice before redirecting the user back to your site. API Call - You can pull the transaction details from Openbucks by sending an API request after the user is redirected back to your site. Please note that you may switch between the two (or even use both) when finalizing your integration code. Each successful transaction will trigger an HTTP Post from Openbucks' payment server to a URL of your choice with all the information you need to validate the transaction. To set the postback URL and postback format (either XML or JSON), you can refer to the Account Information & Settings page. Your listener should return an HTTP response code of 200 to indicate that the Postback was received and processed successfully. Your listener should return an HTTP response code of 200 even if you receive multiple postbacks for the same transaction. 10 min, 30 min, 1 hour, 2 hours, 3 hours, 4 hours, 6 hours, 8 hours, 10 hours, 12 hours, 20 hours, 36 hours, 64 hours, and 96 hours. If all these attempts at re-posting fail, an automated warning email will be sent to the administrative contacts we have for your company. If your merchant account has no administrative contact, an email is sent to our personnel so that they can notify you that there is an issue with your back-end server. Important: returning a response code other than 200 will not cancel the transaction. Important: return a response code of 200 even for multiple postbacks for same transaction. Refer to Required Validation Steps for validating the information returned. See our Postback Listener Code Sample in PHP. "itemDescription": "Credits at 1 cents each"
requestID Internal use only. You should not be concerned about this element. errorCode Always 0 = transaction was successful. Openbucks does not Postback failed transaction attempts. errorDescription Always "OK" = transaction was successful. Openbucks does not Postback failed transaction attempts. transactionID The unique ID of the payment transaction. This ID is the one you, the merchant, should use to correlate Openbucks data. It is this ID that we ask for when someone contacts our customer services department. This ID is displayed in the payment page receipt. pwgcTrackingID A non-repeated unique value. This token is DIFFERENT from the one you passed in req_token. timestampUTC The UTC date and time of the transaction expressed using the SQL timestamp format YYYY-MM-DD HH:MM:SS. pwgcHash The SHA-256 hash of publicKey + ":" + pwgcTrackingID + ":" + [secret_key] where [secret_key] is your Openbucks Secret Key. You use this hash field to authenticate the Openbucks response. At reception you need to re-compute this hash and compare to the one received. Important: The hash is formatted in lowercase hexadecimal with no byte separator. After a transaction is complete, we will redirect the user back to the Success URL you provided in the hidden form or in the Account Information & Settings page. At this time you should make a POST request from your backend server to the API URL provided below to obtain the transaction information. See our Transaction Details API Call Code Sample in PHP. publicKey Your public key as appears under Account Information & Settings page. hash The SHA-256 hash of [token] + [api_secret_key] where [api_secret_key] is your Openbucks API Secret Key. The hash must be formatted in lowercase hexadecimal with no byte separator. The API secret key is used by Openbucks to authenticate you on all API requests. It can be found under the Account Information & Settings page. Note: Change to the production API Secret Key when switching to Production mode. version Optional. Exclude from the request to get the latest version. errorCode The error code of the API call. Will be 0 upon success or a different number upon failure. errorDescription "Success" if the API call was successful or a description of the error if not. token A non-repeated unique value. hash The SHA-256 hash of publicKey + ":" + token + ":" + [API secret_key] where [API secret_key] is your Openbucks API Secret Key. The API secret key can be found under the Account Information & Settings page. This hash field is used by you to authenticate the Openbucks response. At reception you need to re-compute this hash and compare to the one received. version Echo back of the version you provided on the request, or the default one used if it was omitted. Validate the identity of the response by checking that the public key provided is actually yours. Note: when using the API, you should validate the public key in the <authentication> tag. You can additionally validate the public_key in the <payload> tag. Note: when using the API, compute the hash with your api_secret_key and compare it to the hash found in the <authentication> tag. Validate the tracking id merchantTrackingID to confirm this is a transaction you are familiar with. Validate the amount amountValue. Since req_amount is passed to our payment page from the client side, a sophisticated user can tamper with it. Validate the currency code currencyCode. Since req_currency_code is passed to our payment page from the client side, a sophisticated user can tamper with it. Validate the errorCode is 0 for forward compatibility. The Production Merchant Admin Portal includes access to the Production variants of the keys and URLs, located in the Settings page. Sandbox public key Production public key req_public_key parameter in Configuring Your Hidden Form. Sandbox Secret Key Production Secret Key Computation of hash in the Required Hidden Form Fields and in the Transaction Postback Listener. Sandbox payment URL Production payment URL POST URL in hidden form (See: Configuring Your Hidden Form). Sandbox button URL (or tracking pixel URL) Production button URL (or tracking pixel URL) Openbucks button code in your purchase page. (See: Choose Your Openbucks Button). Sandbox API Secret Key Production API Secret Key Computation of hash in Transaction Details API Call. Once you have been promoted to production, you can make a payment and test the complete flow in your production environment. There is a special "brand" of card called the "Openbucks Test" card. The card is disabled by default and does not appear on the payment wall. To use the card to perform production testing, please follow the steps from below. NOTE: the "Openbucks Test" card automatically deactivates (and balance restored to $100) every midnight Pacific Time. To make your integration easier we provide a list of customized ready to use code samples that you can copy and paste into your code. Would you like us to provide more examples? let us know! Note: that we've placed your public key [SANDBOX-PUBLIC-KEY]. The button is wrapped with an <a> tag that points to another script containg the hidden form. // TODO: Replace with your own tracking ID for this transaction. // These are your Openbucks Sandbox keys, when you switch to production replace Sandbox Secret Key with Production Secret Key. Here's how the compiled pay_demo.php looks like. Below is an example of a basic Postback listener written in PHP. // TODO: Do rest of response processing here. Below is sample code to make the getTransactionsDetails API Call. // These are your Openbucks API Sandbox keys, when you switch to production replace Sandbox API Secret Key with Production API Secret Key. If you're not using PHP, you might have a use for the misc function below. Would you like use to provide more examples in your language? let us know! The function below creates a SHA256 hash. Openbucks provides several utility APIs to improve your data retreival and processing. You can also choose the specific data format to be used by adding /xml or /json to the url. By default xml format is used. getTransactionPostback allows you to retreive the information that was sent to your backend servers in the postback after the transaction completed. getActiveCards allows you to retreive a list of active (and non-active) gift cards that are available for your consumers during checkout along with fees associated with each card. getTransactionsDetails allows you to retreive information (amount, dates, fees, etc.) for one or more transactions in bulk. transaction:percentageFee The nominal variable fee due to Openbucks from this transaction in the specified currency. Equals transaction:amount x gift_card_fee_rate (see business contract for details of fee rates). transaction:errorCode The transaction error code. 0=Success. Here are some of the most common questions people ask, should you have any further questions, please let us know! WHERE CAN I FIND TEST CARDS FOR DEVELOPMENT? Openbucks provides test cards for the Sandbox environment in the Sandbox Merchant Admin Portal. Those cards can be found under Review Demo Accounts in the "Transactions" menu. WHERE CAN I FIND TEST CARDS FOR PROUCTION? HOW CAN I SETUP THE POSTBACK URL? You can manage your URLs under Account Information & Settings in the 'Settings' menu. HOW CAN I SETUP THE RETURN SUCCESS URL? If you need a dynamic success url, you can provide it with each payment request in the req_success_url field of the Openbucks form. If you have a static success url, you can specify it under Account Information & Settings in the 'Settings' menu. HOW CAN I SETUP THE RETURN CANCEL URL? If you need a dynamic cancel url, you can provide it with each payment request in the req_cancel_url field of the Openbucks form. If you have a static cancel url, you can specify it under Account Information & Settings in the 'Settings' menu. HOW DO I CALCULATE THE REQ_HASH FIELD? I AM NOT RECEIVING THE POSTBACK. WHAT CAN I DO? Validate the postback url is set correctly. Sandbox: here, Production here. I HAVE A FIREWALL. WHAT IP ADDRESSES DO I WHITELIST TO RECEIVE THE POSTBACK? I AM RECEIVING AN EMPTY POSTBACK CALL. WHAT CAN I DO? WHAT DO I NEED TO DO TO SEND PAYMENTS IN CURRENCIES OTHER THAN USD? To send payments in currencies other than USD, we require you to digitally sign (hash) the req_currency_code and other fields to prevent end users from tampering with the currency.